At the time of writing, the BestMassage EC-06C is THE number 1 bestselling massage chair on Amazon, due in no small part to its bargain price. Will it be a great buy for you? Let’s take a look. At first glance, it’s not hard to see why the BestMassage EC-06C is so popular. The low price combined with the features it offers makes it look like a great bargain. However, let the buyer beware! The reported breakage rate within the first year is low enough (about 8%). But if you should fall within this unhappy number, you can kiss your money goodbye. There is zero after-sales support from the seller, and they do not honor the warranty. Count yourself warned. 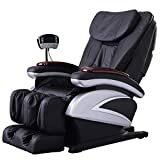 We couldn’t find information about the manufacturer (“BestMassage”), but at the time of writing, Cavalier Wholesale was the best-priced BestMassage EC-06C seller on Amazon. They specialize in selling products at lower than retail price. Their products come with a 30-day money back guarantee, and are tested for quality assurance purposes. Cover: The chair is covered in faux leather. Note that you’ll need a doorway at least 32.5” wide to fit this chair through while still in the box. – Note that this is NOT a zero gravity chair. (Zero gravity chairs allow you to recline in a position optimally suited for relieving the most stress from your spine while you take your massage.) If your heart is set on a zero-G chair, check out our list of the best zero gravity chairs available in the market. The description for the BestMassage EC-06C promises a 1-year limited warranty. Important: See our Cons section below for more information. It’s quite easy to assemble this chair once you muscle it inside. You just need to attach the arm rests with screws, hook up the screen panel, and plug in a wire from the back rest cushion to the heated seating pad. It takes about 10 minutes and can be done alone. Customers are extremely pleased with the quality of the massages they get from the EC-06C. As noted in the features, it offers a combination of a deep-kneading shiatsu massage for your back, a vibrating massage for your buttocks, and an air massage for your arms and legs. It won’t match up to the quality of high-end massage chairs, but it’s still extremely good for the price. The massage works to relieve stress and pain from tense muscles. This massage chair also offers a massage time of up to 30 minutes, in contrast to the 15-20 minutes offered by most of its competitors. Some of the greatest problems for the BestMassage EC-06C are unsurprisingly the same ones that we noted for its sister chair by the same manufacturer and seller, the BM EC-69. There seems about an 8% breakage rate within the first few days or first year. (Interestingly, this is much lower than the 24% rate for the EC-69.) There’s also the chance of the chair arriving with missing parts, such as one buyer reporting the remote control being nowhere to be found. Seven percent doesn’t seem like much, unless you fall into this unlucky group. Then it looks like you’re out your money for good. The after-sales support is non-existent. The manufacturer is impossible to find, with their listed website being defunct. The Amazon seller seems to be by turns unresponsive or uncooperative. They often don’t respond, and if they do, there are still issues. They require you to pay to have the chair shipped back on your own dime if you want it replaced (shipping this chair would cost about $300—half already the cost of the chair). In the interests of fairness, we found 3 reported incidents where they sent replacement parts for the chair with varying degrees of success/ failure. It looks like you’re out of luck (and your hard-earned cash) if you fall into the unlucky group that gets a faulty chair. Note: If you’re thinking of using the SquareTrade electronics protection plan to cover your massage chair, think again. A buyer of the BestMassage sister chair EC-69 reported that he purchased a 3-year SquareTrade plan for his chair. The chair broke down within the first year, but SquareTrade refused to honor the protection plan. The product description itself promises a “1 year limited warranty”. However, as noted above, how exactly can you get your warranty honored if the seller ignores all your attempts at contact? The sad answer is, you can’t. Even if your EC-06C should break within the first year, you’ll have to write it off as a loss—based on the previous experience of unhappy customers. Six feet tall? Great if you want to play basketball; not so great if you want to use this chair. You can adjust the footrests to your leg length while reclining, so that takes care of that problem, at least. You may need to hunch your neck forward and slide yourself down during the massage to try to get the rollers to hit the right spots on your torso. It’s simply not made to be comfortable for anyone taller than 5’9”. The arm rests are particularly troublesome. They’re likely to be too narrow and too short for larger arms. The solution for this is to recline the back more and your arms will be able to fit the arm rests better. If this doesn’t work for you, you may have to disable the arm rest air bags (there’s a button for that) just to be able to fit your arms in. This does give up the arm air massage, sadly. The same problem also arises for the leg air bags. If you have larger calves, the air bags will pinch them painfully. You’re doomed to disappointment if you’re one of those individuals who faithfully look through the instruction manual upon getting a new appliance. The BestMassage EC-06C manual is written in badly translated English and won’t be of much use. On the bright side, it’s not too difficult to figure out the controls when you play around with the remote. The BestMassage EC-06C isn’t as risky a buy as its sister chair EC-69. Based on customer reports, you have a 92% chance of getting a unit in perfect working order. If you’re willing to gamble on this, you could end up with an amazing bargain. Just remember, though—if you get unlucky and end up with a faulty unit, their non-existent after-sales support ensures that you ended up wasting a lot of money instead of saving it.